I like my office workspace. It has what I need to get through each day . . . desktop computer, telephone, robot USB flash drive, exhibition catalogues, personal photographs. It’s my home away from home. But as a museum registrar, my job requires me to leave my workspace pretty regularly. And lately, I’ve been enjoying that mobility more than usual. What has led to my mobile euphoria? Two words . . . i. Pad. My job requires me to work in a variety of locations including art storage spaces and exhibition galleries. Not to mention at museums across the country and throughout Europe when I travel as a courier. And normally, I would carry a bagful of supplies. But no more. 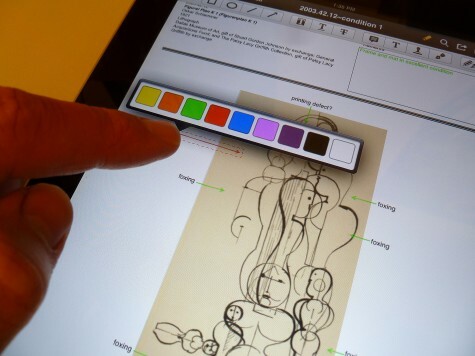 With an iPad handy, registrars can enter framed artwork dimensions directly into the database from art storage. Now with an iPad in my hand, I can leave the clipboard, paperwork, digital camera, and pencil behind when I trek to the galleries or to art storage. Thin and lightweight, the iPad is the near-perfect substitute for the traditional methods of doing several registrarial tasks. In the Registrar’s Department, we’ve developed iPad workflows for tasks including condition reports, incident reports, and art movement location changes. We can also access our database remotely in order to enter data directly without the need for taking notes and returning to our desktop computer. To the layman, these are neither the sexiest nor the most fun things to do with an iPad. But to a museum registrar, they seem heaven-sent. It’s a great feeling to walk out of an art storage space or exhibition gallery knowing that when I return to my desk, I don’t have a step 2 of the process to complete. For several tasks, the iPad allows me to complete all phases of the process remotely. By converting condition report forms to PDF documents, we can now markup these essential documents using the PDF Expert app on the iPad. This app not only has a variety of useful tools, but the marks are editable which makes for cleaner documents. Need to mark up a condition report to show an area of concern on a painting surface? Done. Need to sign, e-mail, and print a shipping receipt from the art dock? Done. Need to edit an exhibition floor plan illustrating art placement changes and e-mail it to the exhibition designer? Done. Need to take a photo of installed casework and record the measurements between objects for future reference? Done. A registrar compares submitted text for an upcoming publication to the text on the object labels in the galleries. Her edits on the iPad can then be saved and emailed to the Publications Department before she ever leaves the galleries. While working on recent exhibitions, both at the DMA and outside the museum, I used an iPad to access crate lists, object checklists, and gallery floor plans, and to send e-mails and photos directly from the galleries. It is so refreshing not to have to sort through piles of paperwork, stapled lists, and hand-jotted notes trying to find what I need. Just a few simple taps of the screen, and I’m jumping between apps and documents with little effort or confusion. We’ve been using the iPads since the summer, and we’ve only begun to unlock the potential. It’s a bit time-consuming to research the apps to find the best ones suited to our needs and then to develop the necessary workflows, but, in all honesty, it’s actually a lot of fun. 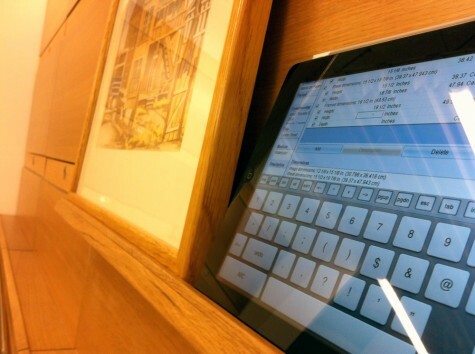 The iPad will be a game-changer for museum registrars, and at the DMA we’re embracing that change one app at a time. Brent Mitchell is Registrar for Loans and Exhibitions at the Dallas Museum of Art. as a retired registrar I sure wish I had had an iPad for many of the travelling exhibitions I worked on- thanks for keeping me up-to-date with techno applications Brent! I’m glad you found this informative, Melissa. It’s pretty exciting stuff! This is a great post… Thanks for sharing! I’d be interested to know how far you had to adjust your procedures to accommodate the technology. Do you have any specific apps you’d recommend, that are particularly useful for registrarial work?